Bismarck is the capital of the U.S. For reviews, where to stay, maps, and more tourist information, use the Bismarck itinerary tool . Duluth to Bismarck is an approximately 6-hour flight. You can also drive. Expect somewhat warmer weather when traveling from Duluth in August: highs in Bismarck hover around 82°F, while lows dip to 56°F. Wrap up your sightseeing by early afternoon on the 10th (Sat) to allow enough time to travel to Red Lodge. Red Lodge is a city in and the county seat of Carbon County, Montana, United States. On the 11th (Sun), take a memorable drive along Chief Joseph Hwy and then cruise along Beartooth Highway. To find reviews, ratings, where to stay, and more tourist information, read our Red Lodge road trip app . Traveling by car from Bismarck to Red Lodge takes 7 hours. Alternatively, you can fly. The time zone difference when traveling from Bismarck to Red Lodge is minus 1 hour. Expect a daytime high around 79°F in August, and nighttime lows around 55°F. Wrap up your sightseeing on the 11th (Sun) to allow time to travel to Yellowstone National Park. Kick off your visit on the 12th (Mon): witness a stunning natural landmark at Old Faithful, then appreciate the extensive heritage of Uncle Tom's Trail, and then identify plant and animal life at Lamar Valley. Keep things going the next day: explore the stunning scenery at S Rim Trail, explore the stunning scenery at Grand Canyon of the Yellowstone, and then hike along Artist Point. To see more things to do, reviews, traveler tips, and other tourist information, use the Yellowstone National Park online road trip planner . The Route module can help you plan travel from Red Lodge to Yellowstone National Park. Prepare for a bit cooler weather when traveling from Red Lodge in August: high temperatures in Yellowstone National Park hover around 70°F and lows are around 38°F. Cap off your sightseeing on the 14th (Wed) early enough to go by car to Jackson Hole. On the 14th (Wed), take your sightseeing to a higher altitude at Grand Teton. 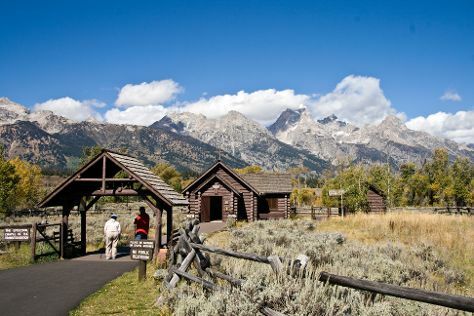 On your second day here, snap pictures at Snake River Bridge, steep yourself in history at Mormon Row Historic District, contemplate in the serene atmosphere at Chapel of the Transfiguration, then explore the world behind art at National Museum of Wildlife Art, and finally make a trip to Town Square. To see ratings, reviews, other places to visit, and other tourist information, use the Jackson Hole online route maker . Traveling by car from Yellowstone National Park to Jackson Hole takes 2 hours. While traveling from Yellowstone National Park, expect somewhat warmer days and about the same nights in Jackson Hole, ranging from highs of 78°F to lows of 43°F. Finish up your sightseeing early on the 16th (Fri) so you can travel to Salt Lake City. To see where to stay, more things to do, other places to visit, and other tourist information, use the Salt Lake City tour builder . Traveling by flight from Jackson Hole to Salt Lake City takes 2.5 hours. Alternatively, you can drive; or take a bus. Traveling from Jackson Hole in August, you will find days in Salt Lake City are somewhat warmer (92°F), and nights are warmer (67°F). Finish up your sightseeing early on the 17th (Sat) so you can travel to Bryce Canyon National Park. Start off your visit on the 17th (Sat): get great views at Inspiration Point, then get great views at Paria View, and then hike along Navajo/Queens Garden Loop. For where to stay, photos, ratings, and more tourist information, go to the Bryce Canyon National Park day trip planning tool . Do a combination of flight and car from Salt Lake City to Bryce Canyon National Park in 4.5 hours. Alternatively, you can drive; or do a combination of bus and car. Traveling from Salt Lake City in August, expect nights in Bryce Canyon National Park to be colder, around 46°F, while days are a bit cooler, around 77°F. Wrap up your sightseeing on the 17th (Sat) early enough to drive to Zion National Park. To see maps, reviews, ratings, and more tourist information, refer to the Zion National Park online holiday planner . Traveling by car from Bryce Canyon National Park to Zion National Park takes 3 hours. In August, Zion National Park is a bit warmer than Bryce Canyon National Park - with highs of 90°F and lows of 54°F. Wrap up your sightseeing by early afternoon on the 18th (Sun) to allow time for travel to Great Sand Dunes National Park & Preserve. To find reviews, photos, maps, and tourist information, you can read our Great Sand Dunes National Park & Preserve trip itinerary planning website . Use the Route module to find suitable travel options from Zion National Park to Great Sand Dunes National Park & Preserve. In August, Great Sand Dunes National Park & Preserve is little chillier than Zion National Park - with highs of 80°F and lows of 45°F. On the 19th (Mon), wrap the sightseeing up by early afternoon so you can travel to Canon City. For more things to do, other places to visit, where to stay, and tourist information, you can read our Canon City online trip itinerary builder . The Route module can help you plan travel from Great Sand Dunes National Park & Preserve to Canon City. Traveling from Great Sand Dunes National Park & Preserve in August, expect Canon City to be somewhat warmer, temps between 89°F and 61°F. You'll set off for Denver on the 19th (Mon). Kick off your visit on the 20th (Tue): steep yourself in history at Union Station, admire the masterpieces at Denver Art Museum, then take a stroll through 16th Street Mall, and finally engage your brain at Butterfly Pavilion and Insect Center. Keep things going the next day: see the sky in a new way at Denver Museum of Nature & Science, admire the natural beauty at Denver Botanic Gardens, then admire the striking features of Cathedral of the Immaculate Conception, and finally contemplate the long history of Dinosaur Ridge. To see other places to visit, reviews, photos, and tourist information, refer to the Denver trip itinerary builder website . Getting from Canon City to Denver by combination of taxi and bus takes about 2.5 hours. Other options: drive; or do a combination of taxi and flight. In August in Denver, expect temperatures between 85°F during the day and 58°F at night. Wrap up your sightseeing on the 21st (Wed) to allow time to travel to Rapid City. On the 22nd (Thu), look for all kinds of wild species at Bear Country USA, admire nature's wide array of creatures at Reptile Gardens, and then take a stroll through Downtown Rapid City. Get ready for a full day of sightseeing on the next day: view the masterpieces at Suzie Cappa Art Center, appreciate the extensive heritage of Historic Old Town, then stroll the grounds of Mount Moriah Cemetery, and finally contemplate the waterfront views at Sylvan Lake. To see more things to do, other places to visit, maps, and tourist information, you can read our Rapid City trip itinerary planner. Getting from Denver to Rapid City by flight takes about 3.5 hours. Other options: drive; or take a bus. In August, daytime highs in Rapid City are 83°F, while nighttime lows are 60°F. Cap off your sightseeing on the 23rd (Fri) early enough to travel to Worthington. Worthington is a city and county seat of Nobles County, Minnesota, United States. Kick off your visit on the 24th (Sat): delve into the distant past at Jeffers Petroglyphs, then steep yourself in history at Ingalls' Homestead, and then examine the collection at Laura Ingalls Wilder Museum. To find where to stay, photos, more things to do, and tourist information, you can read our Worthington online tour builder . Use the Route module to find suitable travel options from Rapid City to Worthington. The time zone difference when traveling from Rapid City to Worthington is 1 hour. Expect little chillier weather when traveling from Rapid City in August: highs in Worthington hover around 77°F, while lows dip to 59°F. On the 25th (Sun), wrap the sightseeing up by early afternoon so you can travel back home.